On a recent Pinterest bender, I discovered Kelly McGuill’s blog O so D. And I’m so glad I did! Her blog title is a playful malapropism of “OCD”: once during a Monopoly game, Kelly’s nephew chided her for being “O so D” since she was more focused on rearranging the little houses on the board in perfect rows than on the game itself! That focus on order and balance shines through in her interiors, so the tag she’s chosen, “obsessive compulsive design,” is appropriate—in the best sense, of course! Her interior design aesthetic is defined by pleasingly spare (but not spartan) interiors that feel fresh and serene. 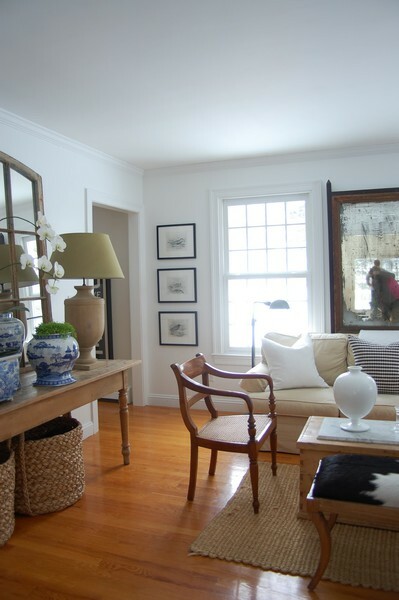 Her clean-lined and light-filled rooms are always perfectly crisp, yet relaxed. 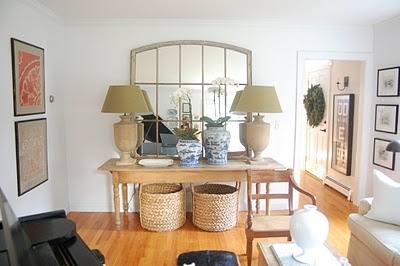 I love the use of larger “statement” pieces that have an almost sculptural quality in the room below—the white urn on the coffee table, the large blue-and-white vases on the console, and that stately lamp give us some clues for how to play effectively with scale. She also weaves in a lot of texture: the natural fiber rug, the hide bench, and those huge baskets under the console provide a lot of visual interest in what is a primarily neutral scheme. Aren’t those baskets amazing? 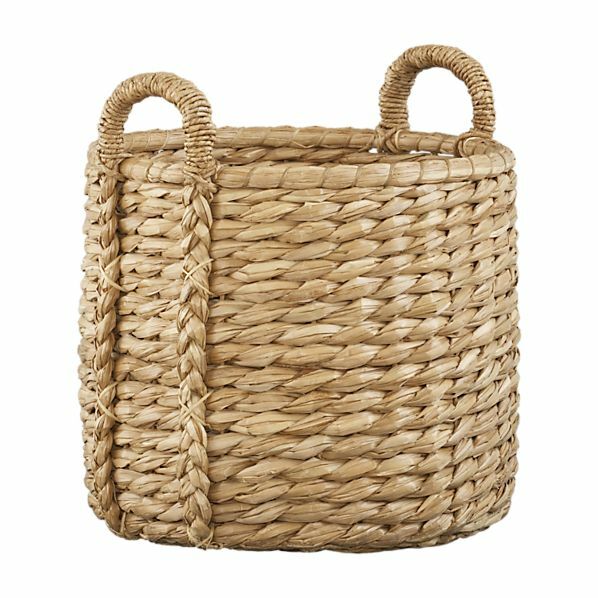 The Crate & Barrel Basay Basket provides a similar look—it’s not only lovely, but a practical, easy storage solution as well. Kelly is also stylist for Restoration Hardware. 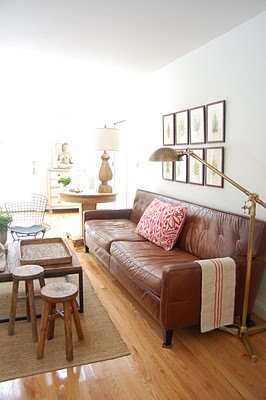 Fans of the store might recognize one of their floor lamps featured in the photo below. The airy and restful quality of this bedroom makes it so appealing. I’d like the bedrooms in my house to have a similar feel. Don’t you think you’d wake up feeling refreshed? 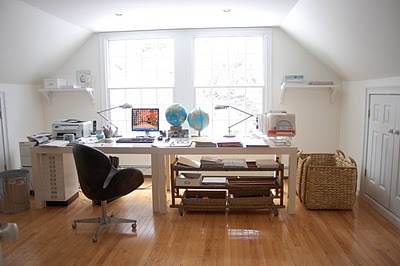 The office space she designed below is really inviting, and I’m taking inspiration from it for my own attic space, which also has dormers and similar layout. Her office design provides good ideas for how to use the space—floating the two worktables in the middle of the room makes for a large and inviting, easily accessible work surface. I like her ideas for storage too—a multi-drawer filing cabinet at left, a table with shelves that provides extra storage under the work surface, and you see those large storage baskets making another appearance in this room! I hope you’ve enjoyed this sampling of Kelly McGuill’s work. I know that it’s inspired me to do some space-clearing this weekend and to think more about how to open up my rooms! If you’d like to see more of Kelly McGuill’s interior design and photo styling, you can check out her website, Kelly McGuill Home, and of course, her blog, O so D.